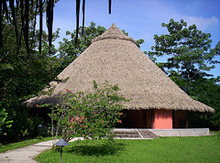 The Archaeological Park "Alma Ata" at CNS is the first archaeological park of its kind in Costa Rica. The Park is set in the beautiful orange orchard of SarapiquiS Rainforest Lodge, where in October 1999, an extensive Pre-Columbian tomb field of at least 600 years old has been discovered. The Park has been developed in close coordination with the Museo Nacional de Costa Rica. Petroglyphs. Reproduction of a stony landscape with petroglyphs. Scientific information is provided all along the trails in the park.